Did you know that the average person gains one pound during the holiday season? (source) That might not sound so bad, but here’s the kicker: that one pound accumulates year after year. That’s right. You gain that pound and it typically stays with you. The study I linked to above surmises that this one pound gain may be a major contributor to obesity later in life. Think about it. Let’s say you start this one pound trend around 25. You probably will barely notice that one pound creeping on each year, but by 45 you’ve gained 20 pounds. Can we make a pact? Let’s actively try to avoid gaining that one pound. Let’s make smart choices. Let’s stay active together and not use the holidays as an excuse to overeat for a month straight. We need a plan. 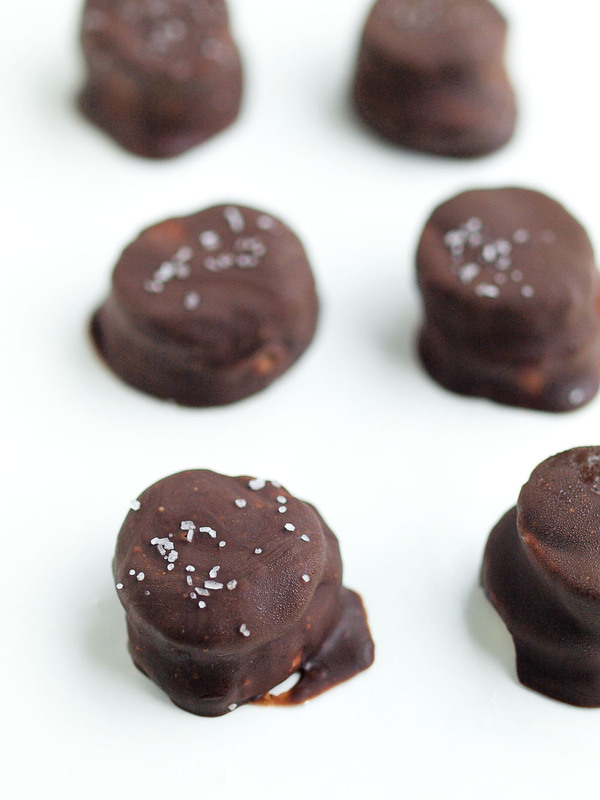 These Salted Dark Chocolate Covered Bananas are part of the plan. Because we all know that we are going to be bombarded with sweet treats from now until we ring in the New Year. Let’s have a healthy, reasonable alternative on hand. We’ll be ready. We know temptation is going to be there. These little sweet treats will help us say no. 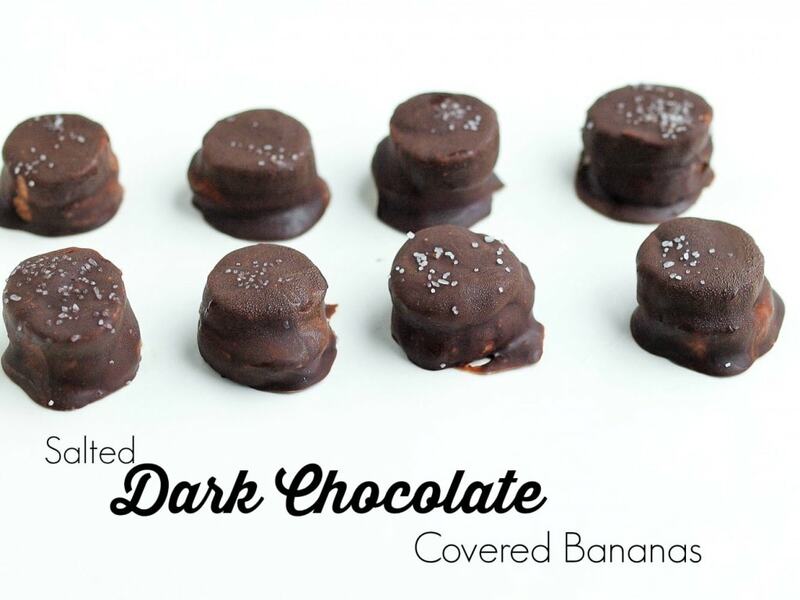 If we have a stash of these Salted Dark Chocolate Covered Bananas in our freezers, we will have something sweet and delicious to eat when the sugar cravings hits. No guilt. Each chocolate-covered bite is around 48 calories, with 3 grams of fat, only 1.3 grams of added sugar (3 grams total sugar with the natural sugars from the banana), and just under 1 gram of protein. Now that’s a healthy dessert we can all feel good about eating, right? Chocolate covered bananas are really easy to make. You just slice your bananas into thinnish slices. Mine were about 1/4 inch. Then I used a tiny smear of almond butter to make a little banana sandwich. Because nut butter+banana+chocolate is pretty much the best combo ever. Then you use a spoon and dip the banana sandwich into the melted dark chocolate. Top with a sprinkle of coarse salt and pop them in the freezer. (Do not skip the salt. Trust me!) Easy peasy. Healthy dessert ready to go! We’re in this together. 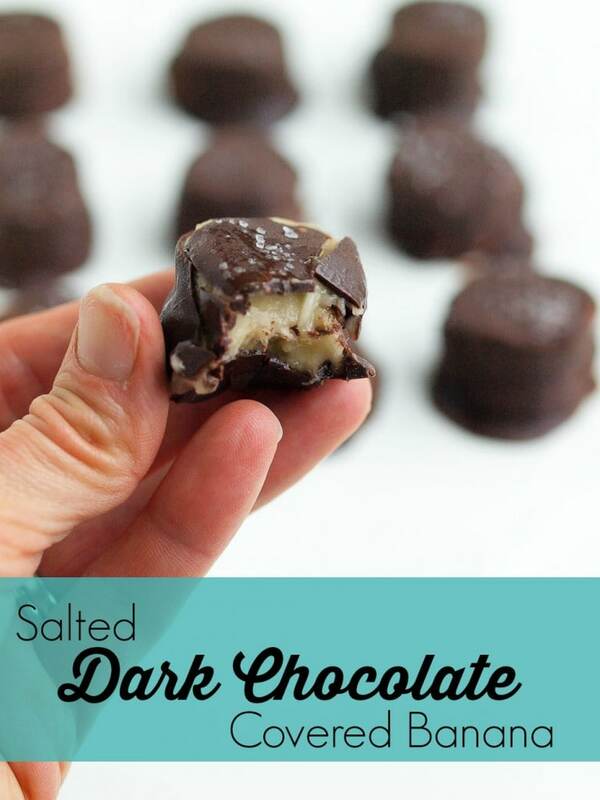 These Salted Dark Chocolate Covered Banana are a healthy way to satisfy your sweet tooth! Line a baking sheet with wax or parchment paper. Melt your chopped chocolate. I like to do this in the microwave (1 minute on 50% power, followed by 10 second increments until melted) using a glass measuring cup. I find that the taller, thinner shape of a measuring cup works better than a bowl for dipping the banana slices. Make a “banana sandwich” by putting a small smear of almond butter (or nut butter of choice) in between two banana slices. Put the banana sandwich on a spoon and dip it into the melted chocolate. Rest the spoon on the edge of the measuring cup to allow excess chocolate to drip back down. Place the chocolate-covered banana on the baking sheet and repeat until all of your banana slices have been used. Top each chocolate-covered banana with a small amount of coarse salt. Freeze until set, about 15 minutes. May be stored in the freezer or refrigerator. Enjoy! I like to store these in the freezer and pull one out as needed. You can eat it straight from the freezer, or let it defrost a bit if you’d like the banana to be a little creamy like the top picture. These little babies are going to keep us on track this holiday season! yum! i’m always looking for a sweet healthy treat! 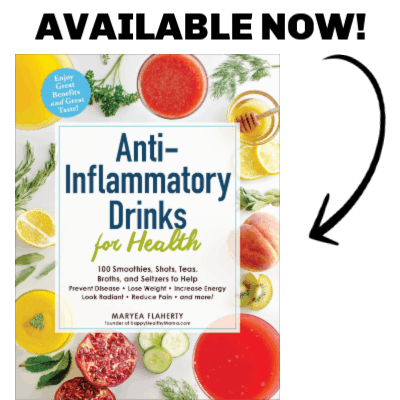 These are great for a quick and easy healthy treat! These look sooo yummy!!! May have to make these for my little guys. Littles ones will love these! Another yummy treat! Thanks for sharing! They look wonderful! I may attempt these for Harper’s birthday party this weekend! These would be a fun birthday treat! Sometimes the simplest treats are the best! These look just perfect, and I love how you sandwiched some almond butter in them! Pinned! It’s true–all I need is a little dark chocolate with salt and I’m a happy girl! Yum, we will definitely use Sunbutter for these delicious looking treats! I think I will next time, too! I think they’d be great with Sunbutter. Yum! These look so good! Will have to make them soon! Thanks LeAnn! I hope you enjoy them! Those look absolutely divine! I’m not sure I could stop at just one. These are SO cute. They look like the perfect after dinner snack for when you’re craving a little something sweet! Oh yum! I love a desert with fruit in it. Makes me feel a little less guilty about eating all that chocolate! Thanks so much, Elizabeth. I’m actually going to see my mom Friday and am super excited!! Love the idea of these as a tasty treat for my family! this is so going on my list! all my favorites! great idea maryea! LOL I actually found this post on Pinterest before I saw you post in on tuesday share! 🙂 LOVE IT! That makes me smile. 🙂 Thanks so much, Jennifer! I so appreciate your point about the one pound! The funny thing is that most people talk as though we gain ten pounds over the holidays, and of course, the majority of us don’t. That’s A LOT of extra calories! But it’s the weight gain that sneaks up on us that is more insidious. I think if we suddenly did gain a huge amount we would be more likely to get it in check, but the slow gain is, like you said, easier to let slide. Yes, exactly! Nobody notices a pound. But it’s the fact that it stays with you and you gain one more the next year, and the next year, and the next year that is concerning. It really does! Thanks, Kelsey. The horrible ads on this site make the recipe un-printable. Not helpful for sharing at a recipe exchange. Thanks for your comment. I have no problem printing my recipes, so I am not sure what’s happening on your end to make them unprintable. I’m not sure if you’re aware, but I offer all of my recipes to my readers for free. This is my full-time job, and if I didn’t have ads on my site I would be working for free. Ads are my main source of income, and without them I would not make any money. Most people I know are not willing or able to work for free, so that is why I have ads on my site. As much as I’d love to be able to have an ad-free site (I really would!) at this time that is the main way blogs are able to be monetized. I wish you well!